Cinecultist has been thinking a lot lately about where our excellent taste comes from. Just in case you haven't figured it out, CC and staff is on the cutting edge of just about everything, dah-ling. 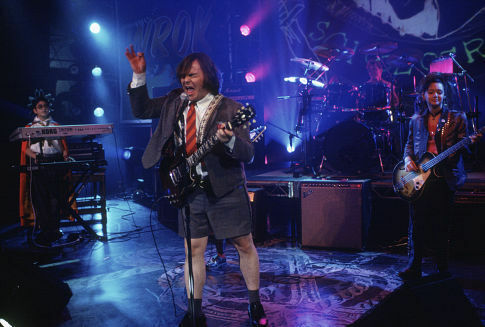 Years of hard work to develop this taste, we certainly never had a teacher like Jack Black in the School of Rock, sitting down to give us the history of pop expression at an impressionable age. Black, the other half of rock group Tenacious D, plays Dewey Finn a washed up bass player still holding out for that big break in rock n' roll. His roommate, Ned (screenwriter Mike White) and Ned's girlfriend (stand-up comedian Sarah Silverman) insist Dewey contribute to the rent and so Dewey starts substitute teaching at a prep elementary school pretending to be Ned. Even when his movie's scripts are less than stellar (as in Saving "surprisingly amusing though seriously dumb" Silverman or Shallow "oh no Farley brothers" Hal), Black still has a charm and charisma that translates into some great moments. But here Black has a delightful script from White (the Good Girl) and a sure hand behind the camera in Richard Linklater. His report with the kids is also delightful as he convinces them to abandon X-tina for Robert Plant and Jimmy Hendrix. The movie has wonderful momentum, the two hours sail along with energy and the audience CC watched it with sat through every last credit, they just didn't want to go home. We can understand that, Jack Black was on the screen.